Good morning friends, today I’m excited to be hosting a fall blog tour! 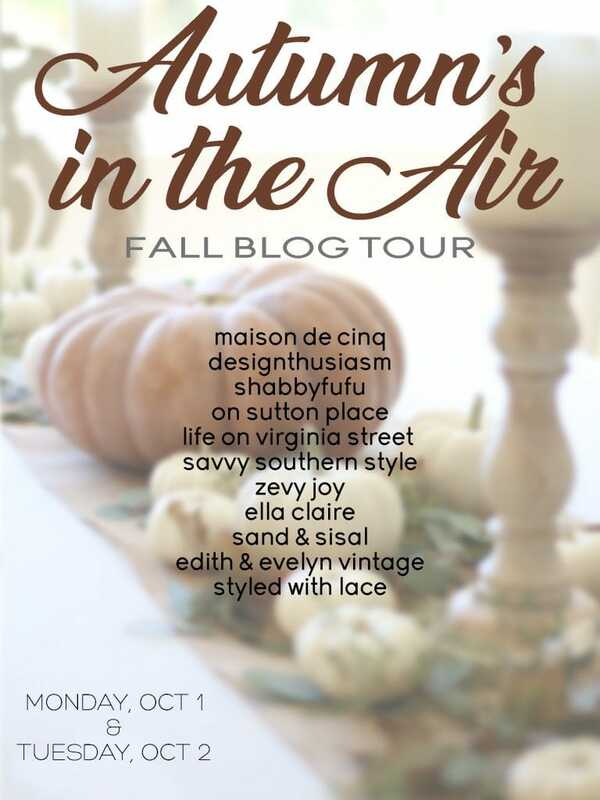 I’ve hosted my Autumn’s in the Air tour for three years now, and am so glad to be doing it again this year with ten of my favorite blogger friends. If you’re coming here from Styled with Lace or another of the blogs and are new here, welcome! For me, I think it’s always better to break up my tours by room. Not only is it overwhelming to go through a long tour, but this way you can see the rooms you’re most interested in without having to scroll through a ton of photographs. 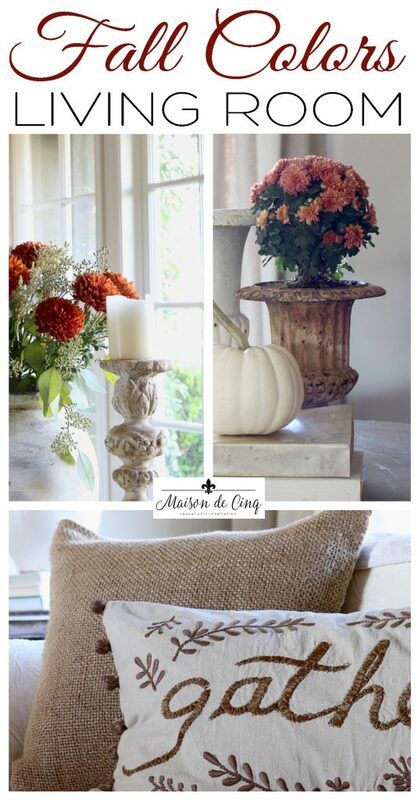 So today for my final tour of the season, I’m sharing my fall living room tour with you! I actually like decorating my living and dining rooms the best, so I guess you could say I saved the best for last 😉 They are the rooms you see when you first enter the house so they definitely set the tone. They might be the ones we spend the least time in, but they are the first impression! So welcome, happy fall (it’s official now, right?) 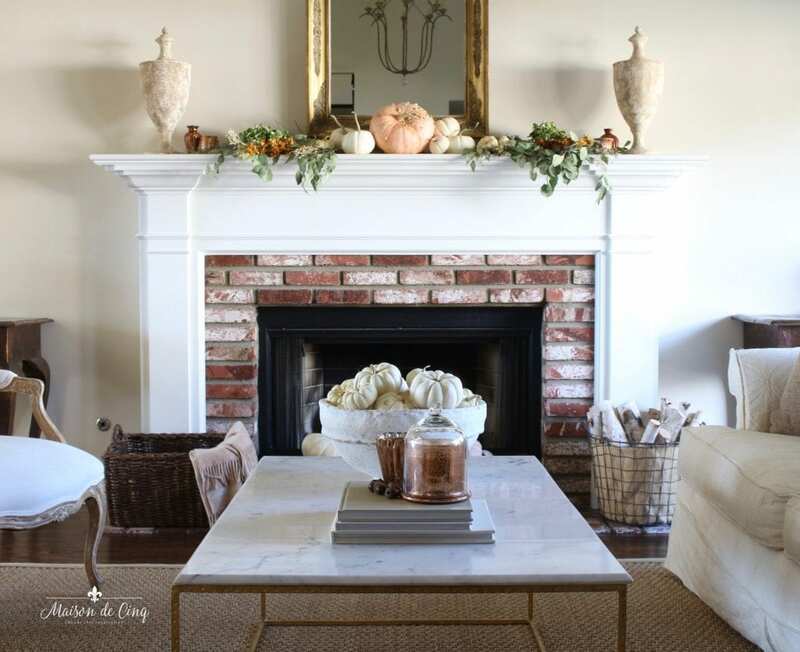 and come on in to my fall living room and dining room tour….. If you’ve been following me for awhile now you know I’m not really much of a faux flowers girl, but I am coming around, haha! Mainly because I’m in Southern California and our leaves don’t turn until about the end of November so I really don’t have a choice! In order to bring some fall foliage in, I had to use faux, but I do think these look particularly good. 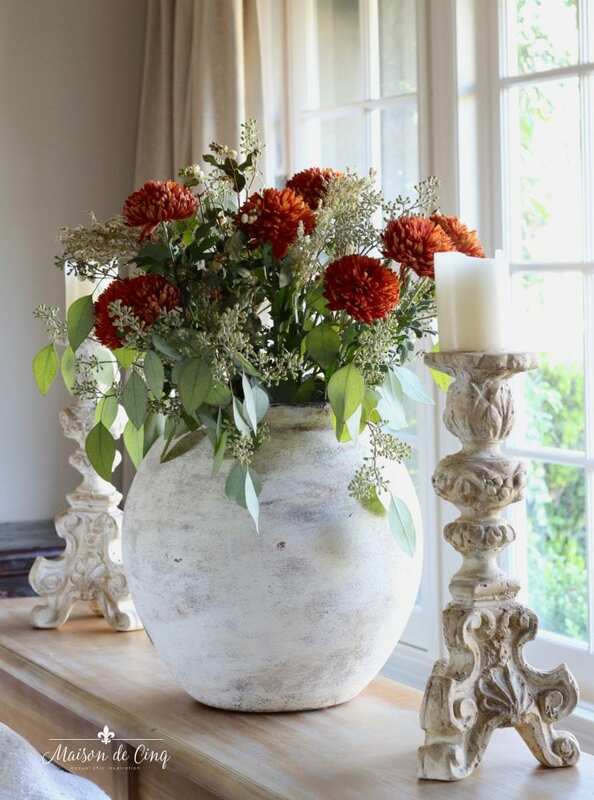 The vase is from Pottery Barn and one of my favorites. I’m loving the traditional fall colors this year – this from the girl who usually does “neutral fall”! I’m not sure why, but the warm colors are really speaking to me. And they do brighten up my otherwise neutral spaces! 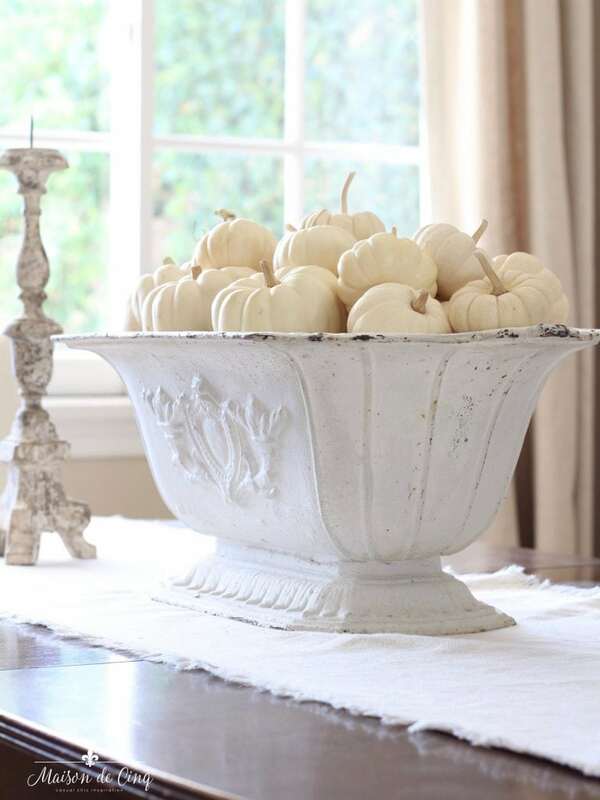 The urn on the dining table is vintage and I filled it with my favorite – white mini pumpkins! In the living room I still have the mantel decorated, and I also have pumpkins spilling out of the fireplace. 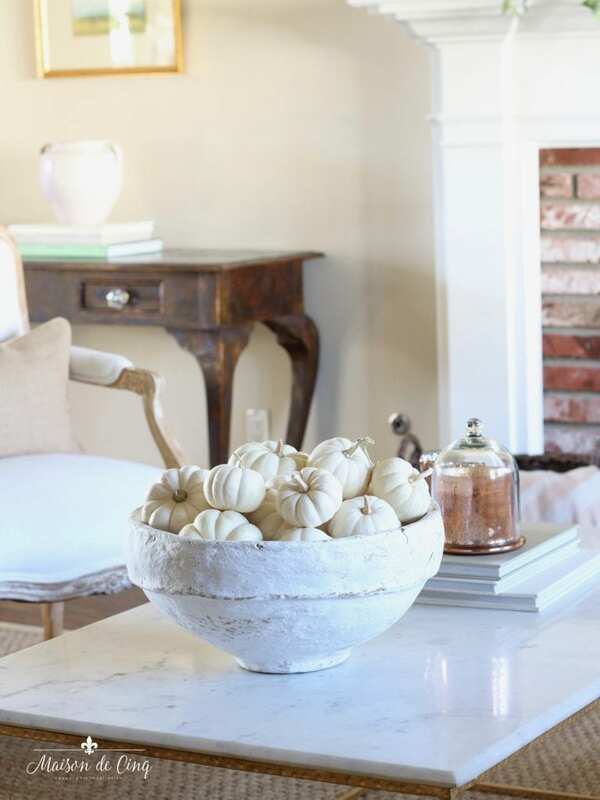 Another vessel filled with white pumpkins! This one is a vintage papier-maché bowl that I bought recently at a flea market. 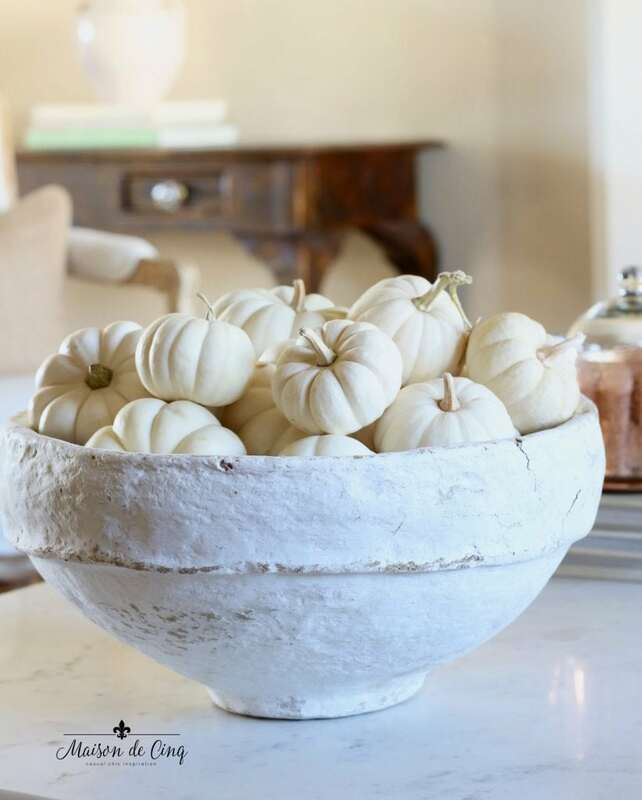 But of course, mini white pumpkins look good in about anything you put them in don’t you think?! 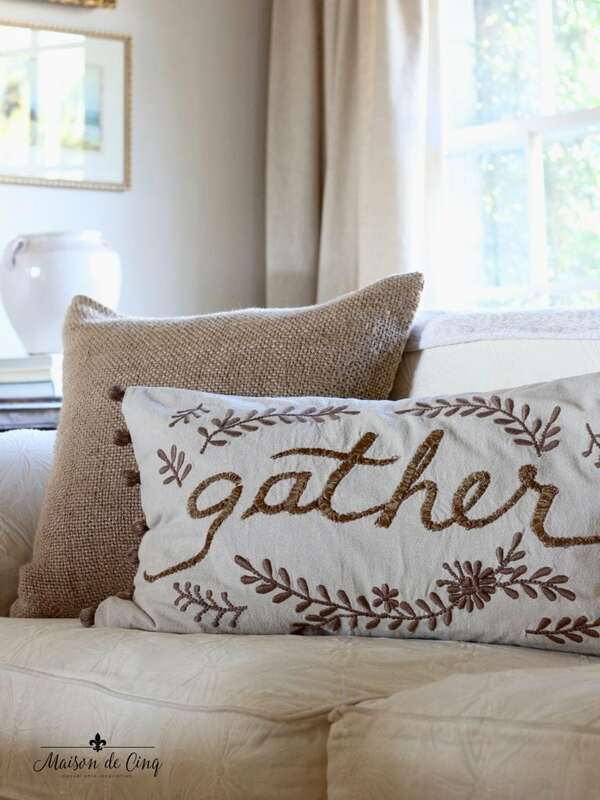 The “Gather” pillow is from Pottery Barn and is one of my favorites! I bought it last year at the end of the season, but it is still available! It looks great mixed with my linen/burlap ones. 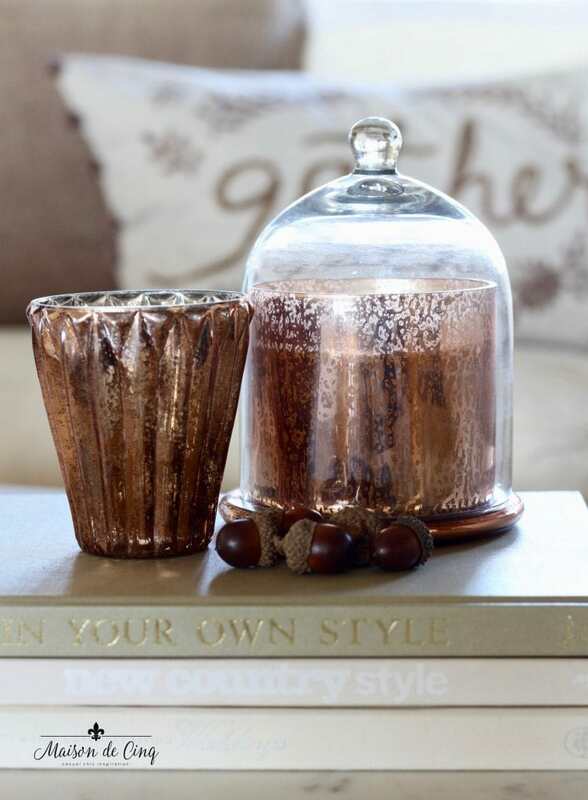 I’m loving copper this year and have been sprinkling it everywhere I can! Here I used a candle, along with one of the copper votives that I also used in my mantel tour. I love their color and the size is so versatile – you can literally use them anywhere. The acorns are from Crate and Barrel and they look so real. I went with some fall color in the large vase on my console table. And a little faded orange mum in my vintage French urn! 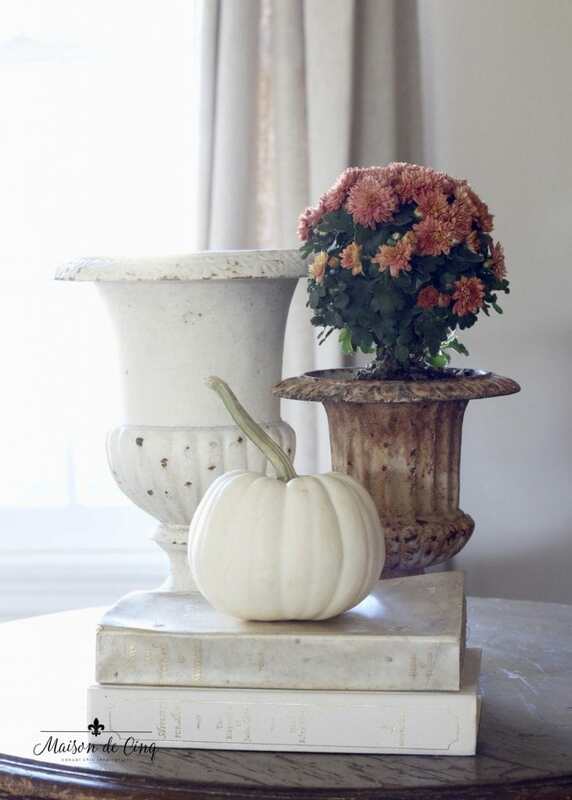 I mixed that with a white Casper pumpkin and another French urn to create a vignette on the side table. 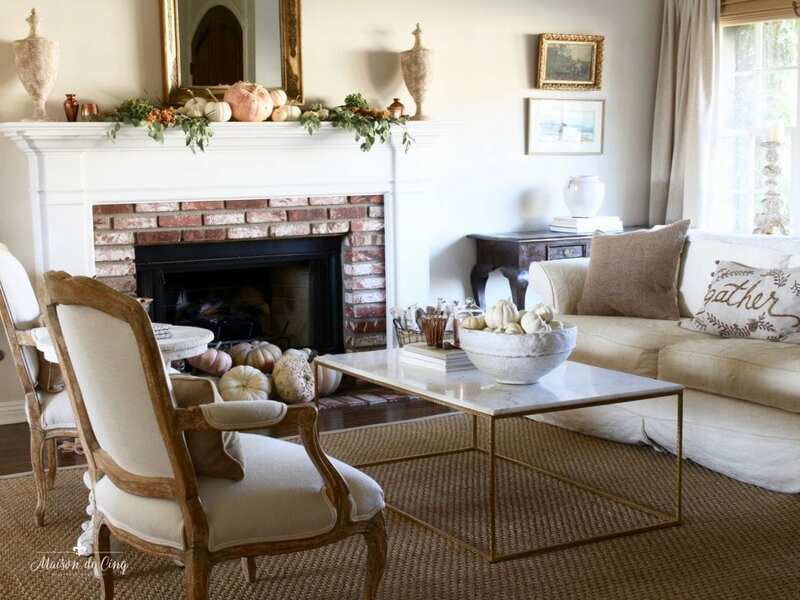 I hope you’ve enjoyed my fall living room tour, and I also hope you’ll hop over to Lory at Designthusiasm next – she has such gorgeous taste and always does such beautiful flowers! There are 11 of us sharing between yesterday and today, so there’s lots of fall inspiration to be found! 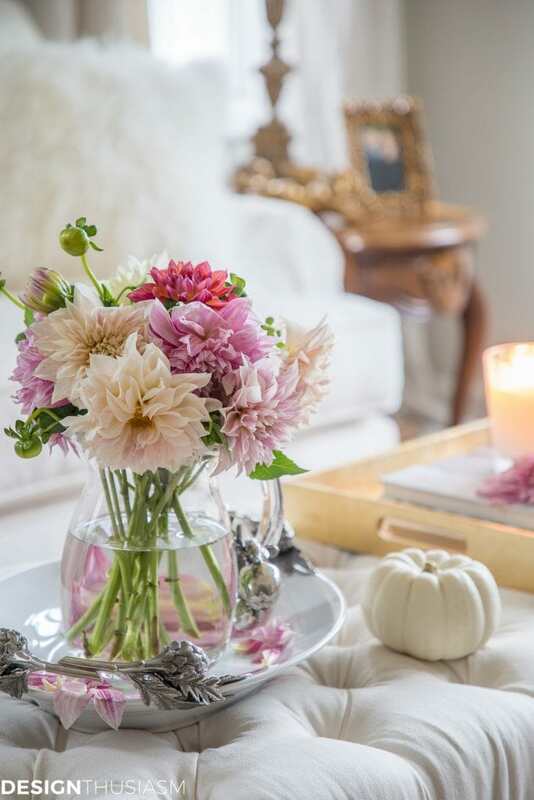 So enjoying the gorgeous homes on the tour….Your home is so beautifully dressed for Fall in its subtle Autumn colors….I love that PB vase too! Happy Fall Sheila! Thank you Shirley! Happy fall to you as well, and thanks so much for stopping by! Sheila, What a beautiful tour of your lovely home! 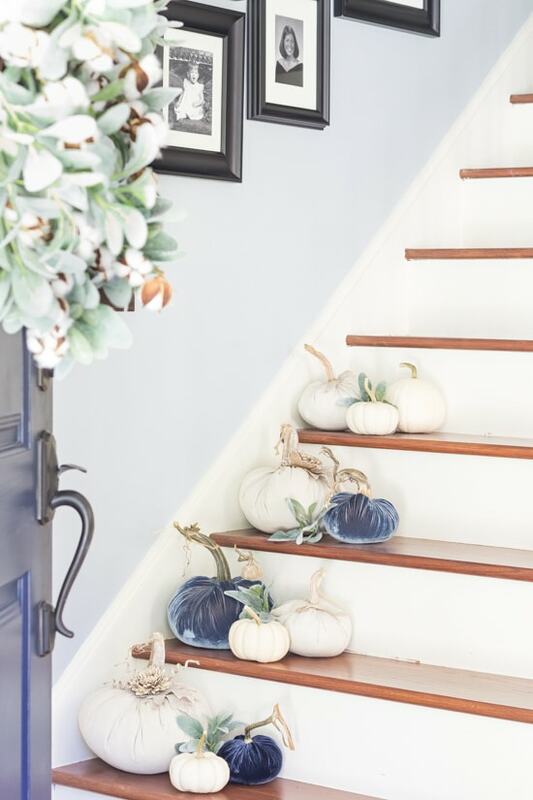 Those mini white pumpkins get me every time! Thanks so much for organizing, we always love doing this hop with you!! I’m a sucker for the mini whites, too Kim! And you’re so welcome – happy to have you! That is SUCH a nice compliment – thank you so much Patricia!! I really appreciate your kind words of support and your subscription! Thanks so much for hosting Sheila! I have coveted those PB urns for years now! I wish I had bought them earlier! 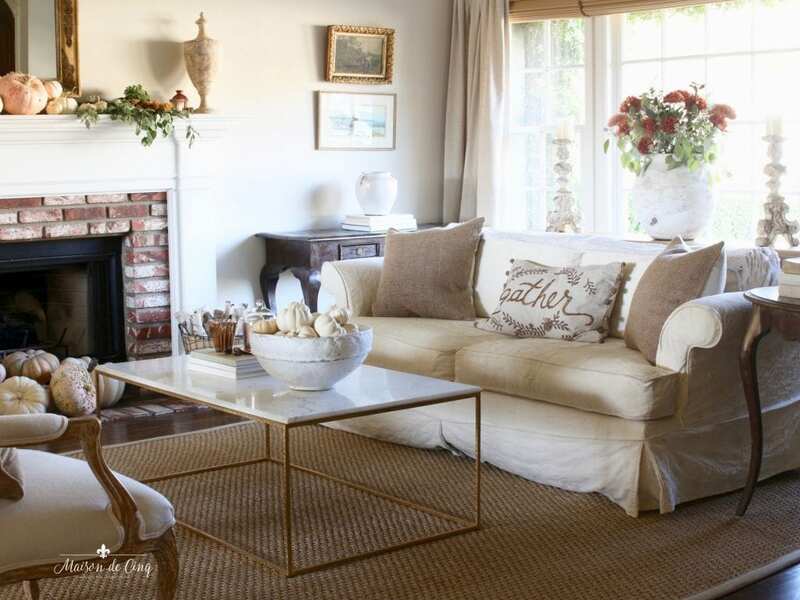 Your home looks so inviting and lovely! Thanks so much for your kind words, and for being a part of the hop! Loved your tour! 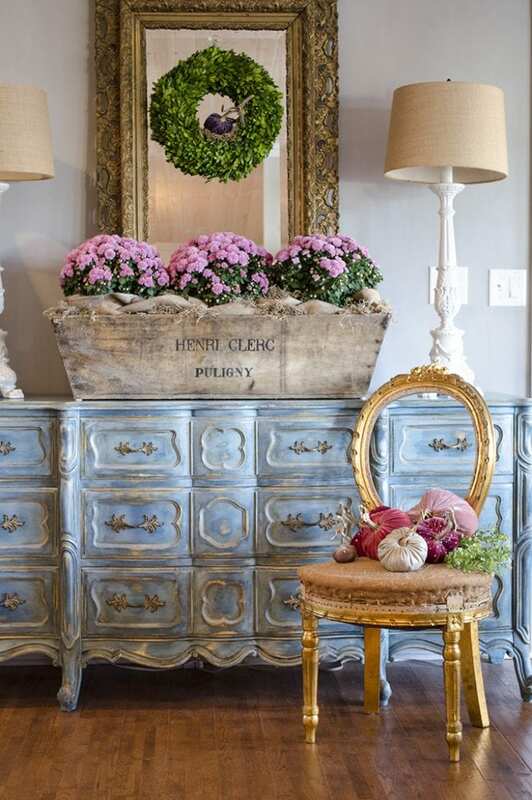 Love your posts—and the way you decorate! I just ordered the Gather pillow and am looking forward to creating some autumn beauty in my home. Aww thank you so much Rosalind – it’s so nice to hear from a friend that they like the blog! I think you’ll like the Gather pillow, it’s so cute and definitely works from September all the way through Thanksgiving! Sheila, I love the way you’ve added fall color!! It’s still very delicate in your way, but just the right touch… 🙂 Funny, I was thinking I’m not usually a fan of leaves, but yours look so great. Then I read they were faux! Well done!! Thanks for including me! 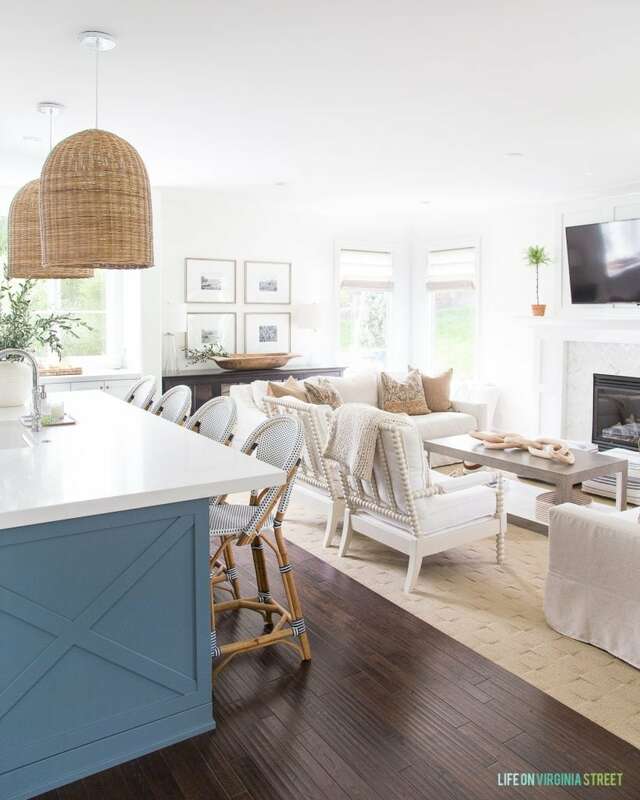 Your home is a feast to the eyes! 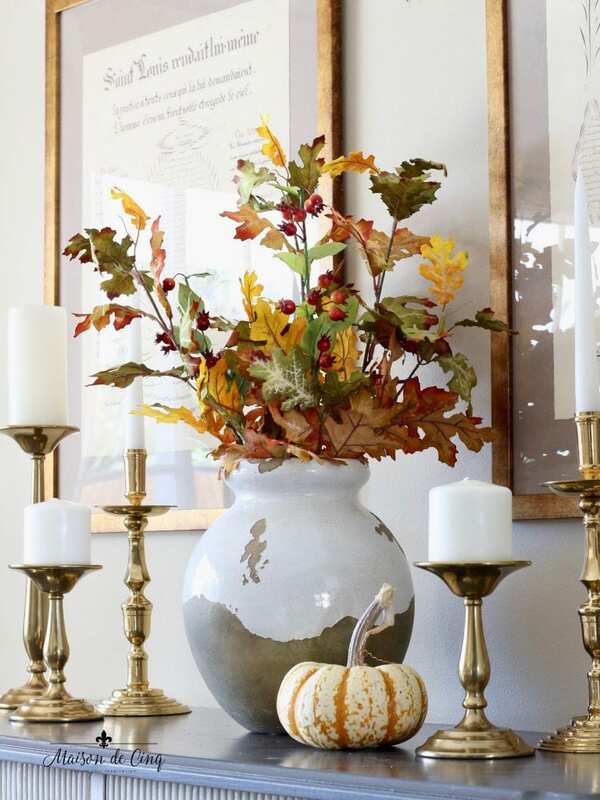 I so enjoyed going from room to room seeing all of your lovely fall displays. 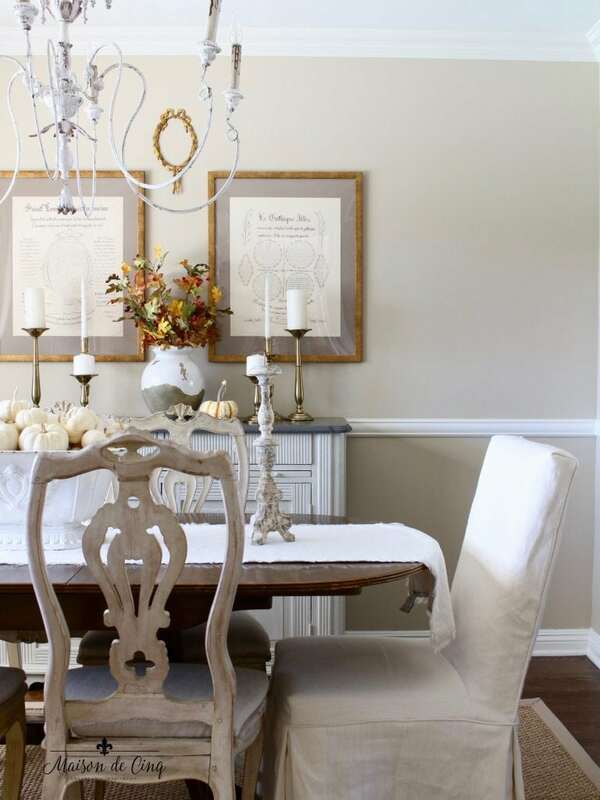 I believe I pinned most all of them to my cherished Autumn Boards that I so love! Autumn is my favorite of all seasons so you can perhaps understand why I was so enthralled with your beautiful post! Thank you so much for such delightful entertainment! Happy Fall!! I so appreciate you stopping by! Happy fall to you as well! 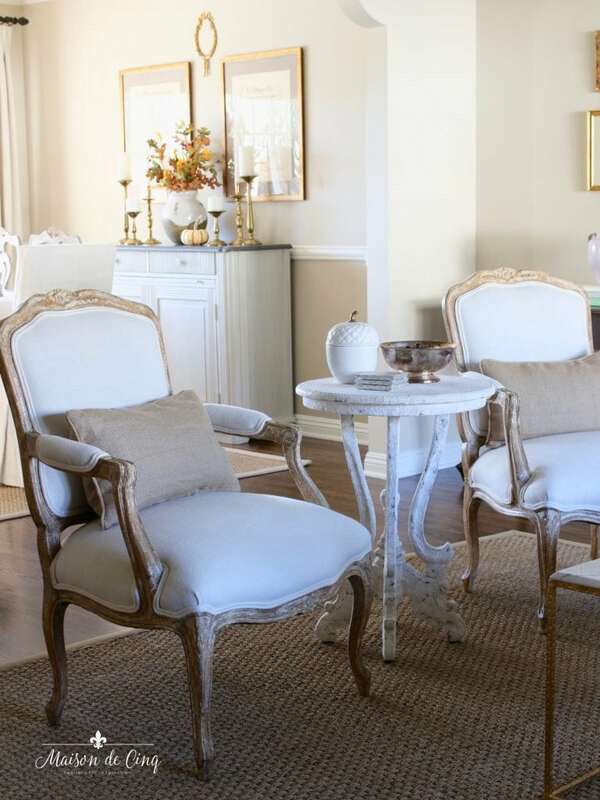 Beautiful dining and living rooms, Sheila. 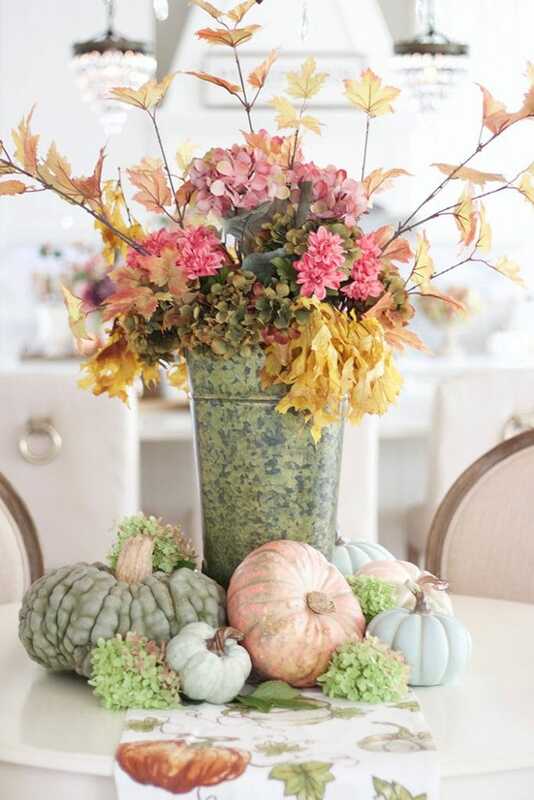 I love the natural elements added for just the right amount of fall. I have that same gather pillow and need to pull it out. Thanks so much Kim – and thanks for joining us!